alaTest has collected and analyzed 18 reviews of DeLonghi Combi BCO 330T. The average rating for this product is 3.3/5, compared to an average rating of 4.4/5 for other products in the same category for all reviews. People are impressed by the noise and price. The durability and performance also get good comments. Some have doubts about the maintenance. We analyzed user and expert ratings, product age and more factors. Compared to other products in the same category the DeLonghi Combi BCO 330T is awarded an overall alaScore™ of 84/100 = Very good quality. We bought this product in November of 2015 and it is no longer working for some odd reason. I will never buy another product from Delongi again! Complete waste of money and now I can't even return the product b/c I no longer have the receipt. 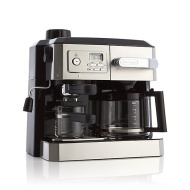 This has been a great coffee maker, quick brewing, a nice hot cup of coffee. Also love the espresso maker feature. Fun to make lattes every so often. Love having the combo feature!